Years of toil in the desert have shown biologists that lizards value their relatives, says Sandeep Ravindran. Illustrated by Reyn Ojiri and Benjamin Witzke. 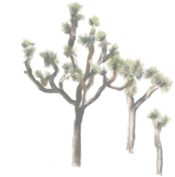 Alison Davis crouches in the Mojave Desert, her legs sore and her hands sliced full of cuts. She’s spent hours looking under fallen Joshua trees and abandoned pieces of furniture, hoping the sand under the next log or discarded dresser holds what she seeks. Davis carefully rolls over a log and moves its leaves aside, a task akin to “peeling apart razor blades,” she says. Every cut in her skin itches and swells. But then she sees her target: a ball of tiny lizards. Some are as small as toothpicks, and their brown, mottled skin blends in with the desert dirt. The painful hunt was worth it, for she has found that unlike nearly all reptiles, these desert night lizards form long-lasting families. 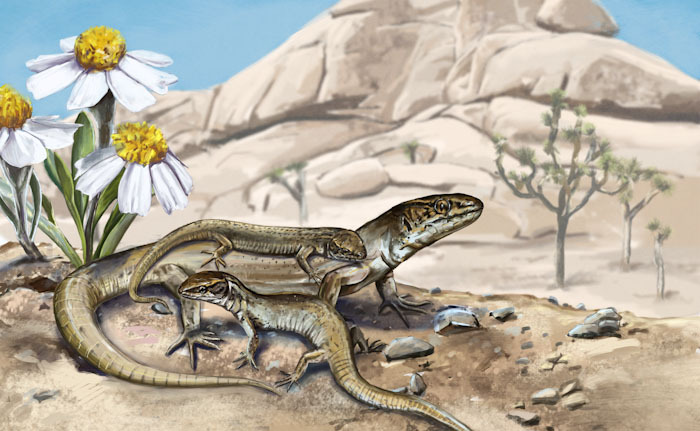 These lizards could reveal why organisms first started forming family groups. To demonstrate those ties, Davis needed only to find 2,300 lizards and to monitor them, individually, for years. Davis recalls many a childhood hour spent in the reptile house at the Phoenix Zoo, part of her life-long fascination with these animals. But her original plan was to examine social systems in mammals or birds, where biologists have traditionally studied them. Most lizards are solitary, and reptilian social groups had only previously been observed in a few Australian lizards. Davis’s plans changed when she read a 1960s journal article about desert night lizards. She was fascinated by a few sentences about them forming aggregations. She headed out to the Mojave Desert in 2001, and found the lizards near the site described in the old article. Still an undergraduate, she started studying why these lizards lived together. Having social systems in lizards makes it easier to ask how these systems evolved, Davis says. Unlike mammals and birds, which always form social groups, lizard species expose the differences between solitary and family-friendly ones. Lizard social groups are also simpler to study. “In complex primates, you have to be Jane Goodall and sit and watch for 30 years to make any conclusions,” Davis says. For desert night lizards, she notes, it boils down to one question: “Do they lay on top of each other, or not?” Lizards also have much shorter lifespans than most birds and mammals, so generations fly past. Tests of evolutionary theory are much faster in social lizards as a result. But getting the lizards and doing the experiments is hard work. Most lizard habitats are in deserts and mountains: cold and snowy in winter, and really hot in summer, Sinervo says [see sidebar: Too Hot for Lizards]. And you have to catch a lot of lizards. That turned out to be one of Davis’s unusual skills. Davis headed to the Mojave Desert for two weeks every summer and winter for five years, learning how to catch and tag thousands of desert night lizards. “One of the challenges was to just locate the lizards,” says Ammon Corl, a fellow graduate student who helped Davis capture them. In winter, snow draped the desert in layers of cotton-white, glistening off fallen logs. Thankfully, the lizards “would often be too cold to move too much,” Corl says. Their most productive winter yielded 500 to 600 lizards in a couple of days. The work itself was “dirty and sweaty and sharp,” Davis says. At her site in the Western Mojave, she would flip over every log and piece of trash in a 36-hectare area—as large as 80 football fields. She hunted lizards for 10 hours a day, with no shelter from the hot summer sun or the brutally cold winter winds. She put the lizards in plastic cups and took them back to her camp. There, she snipped a tiny piece of each one’s tail for DNA analysis. She also marked the toes of each tiny lizard in a pattern unique to each one, allowing her to re-identify the animal the next season. Within a day, she returned each lizard to its exact log or piece of trash, using GPS mapping and flagging tape. Davis used the DNA to confirm that each ball of tightly clustered lizards consisted mostly of family members, each at least as related as first cousins. She wondered whether all these related lizards actively chose to live together. 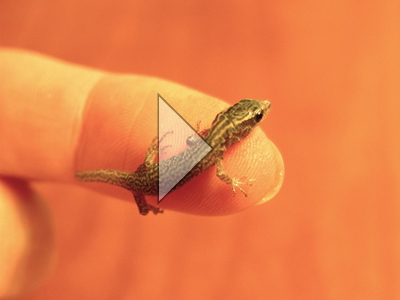 To test this idea, she collected newborn lizards and paired them either with their own mothers or with strangers. She first tested the pairs of lizards in the lab, where she built a little Plexiglas arena with tracks for the lizards to walk on. The lizards were in a container with small holes, so only the baby could get out. As the baby walked away from its mom, it crossed a series of bridges built over small pits. The bridges pivoted in the middle like tiny seesaws, tipping over to let the baby cross. But once the baby was through, the bridges raised back up to prevent any return trips. Using this setup, Davis measured how far the babies walked when they were with their real mom as opposed to a stranger. Then came the hard part: repeating the same experiment in the field. 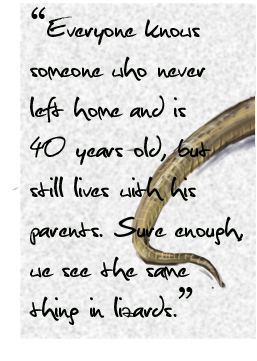 Davis released the lizards and followed them for five years, monitoring whether being with unrelated lizards affected the baby’s decision to live with them. That’s the only time Sinervo said an experiment wouldn’t work. He told her, “‘You’re never going to find the babies again,’” Davis says. But she did—it just took patience, and lifting a lot of logs. “Practice makes perfect,” she says with a smile. Both in the lab and in the field, Davis found that babies placed with strangers dispersed further and dispersed more. They were less likely to form groups, and even when they did, the groups were smaller. “Either parents are more tolerant of their own kids, or the babies decided to stay,” she says. What drives the lizards to stay with family? After all, living with family isn’t without its drawbacks. In the animal kingdom, it leads to competition with siblings and parents for food and shelter. Group-living also makes it easier for individuals to catch infections and parasites from each other. Given these costs, family life must provide significant benefits. In birds and mammals, parents stay with their kids because the babies would die otherwise. But lizard hatchlings are self-sufficient, and there’s little reason for their parents to stick around. There could be other advantages—for example, group-living may help some Australian lizards be more vigilant against predators. 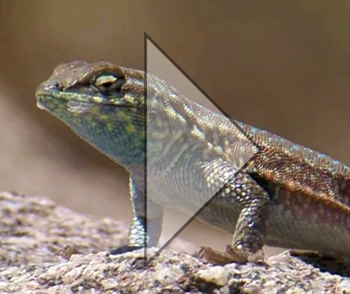 Desert night lizards may get similar benefits that help them survive their harsh habitats. Desert night lizards are seasonal socializers, living with their families only in winter. The family units dissolve in spring, only for the same lizards to regroup each fall. They sometimes repeat this process for several years. Davis is now exploring the idea that desert night lizards actively form families to survive the cold winters. Family units are common in a wide variety of organisms. “The really big question is why stable group living is so uncommon in lizards and other reptiles,” says Michael Bull from Flinders University in Australia, who studies Australian lizards. Despite many of these lizards sharing similar ecological niches, only a few form social groups, Bull says. It’s as if someone threw an evolutionary switch separating a few social lizards from the solitary majority. Davis wanted to figure out what triggered the switch. When she examined all the lizards thought to form social groups, she found that they all gave birth to live young. She suggests that compared to most reptilian parents, who just lay eggs and wander off, a long association between mother and child in utero kickstarts family formation. This is consistent with the evolutionary theory that the longer parents and kids remain together, the more likely they are to form families. The link between live births and the evolution of families is plausible but tentative, says evolutionary biologist David Chapple at Monash University in Australia. He says it doesn’t account for the large number of Australian lizards that give live births but don’t exhibit this kind of social system. But Davis says the more telling evidence is the paucity of egg-laying species that have developed social systems. If sociality arose randomly among lizard species, about 80 percent of social species should lay eggs, she says. Instead, researchers have found just the opposite: 90 percent of social species give live births. Regardless of whether live birth gave rise to families, Chapple agrees that Davis “convincingly demonstrates that a kin-based social system is present in the desert night lizard,” despite the rarity of these systems in the reptile world. The fact that desert night lizards are only distantly related to the social lizards studied in Australia means that they must have evolved these behaviors independently, says evolutionary biologist Rick Shine of the University of Sydney in Australia. Davis’s study “adds to a growing realization that reptiles are a lot more complicated than anybody ever thought,” he says. Researchers can now use reptiles to test theories that arose from studying sociality in birds and mammals. Because not all lizards form families, scientists can study different ones to tease apart their evolutionary transition from solitary living to family groups. For her part, Davis has started studying desert night lizards in a different setting in Panoche, near Pinnacles National Monument in central California. “No one knows the social systems in Panoche,” she says. By comparing these isolated lizards to the ones in Mojave, the researchers will learn how families evolve in different populations. But these lizards are even harder to find. The researchers must drive off-road and then hike across steep ridges to get to the small patches of yucca where they live. Davis will be happy to collect 60 to 100 lizards, total. Her goal is a database of social behaviors in a variety of night lizard species. “I hope more people study them,” she says. The field is wide open, with almost everyone having overlooked these tiny creatures. “They’re pretty mundane. They’re just sort of unassuming,” says Davis. The enigmatic nature of the desert night lizard, Xantusia vigilis, is evident in this excerpt from a coffee-table book on lizard ecology, Lizards: Windows to the Evolution of Diversity: “What really goes on under the cover of Joshua tree rubble where tiny-bodied long-lived Xantusia interact year after year. . .? Only the imagination and creativity of the investigator limit research opportunities when it comes to lizard social behavior.” As Davis transcends these limits, the little lizards she studies may help answer some big questions about why families arose. Temperatures have increased since the 1970s, a millennium’s worth of change on lizard time scales. 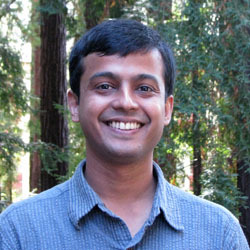 “Climate change is the most pressing issue facing the world right now,” says Sinervo. In a study published in the 14 May 2010 issue of Science, Sinervo and his collaborators revealed that certain lizard populations have gone extinct in Africa, Mexico, Europe, and Australia. “The lizards are undergoing rapid extinction because they just can’t keep up. The changes aren’t happening over millions of years,” he says. 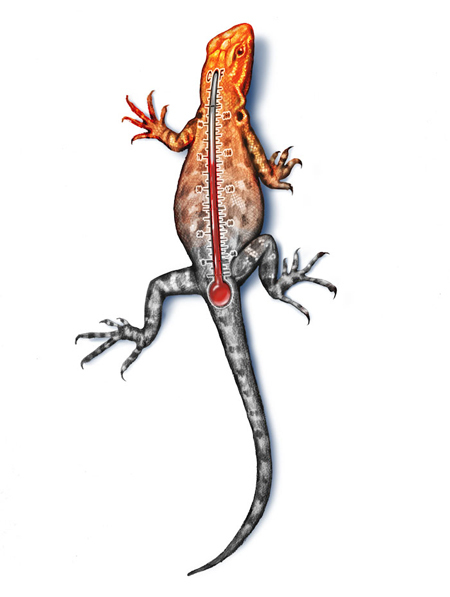 Lizards are cold-blooded, which means they regulate their temperature by changing their behavior. If they’re cold, they might bask in the sun for a while. If it gets too hot, they move to the shade. As global temperatures rise, venturing out from cooler areas could cause lizards to overheat and die. But staying put isn’t an option—they need to find food and mates. Either way, it’s bad news for their survival. What's more, Sinervo says, “Lizards that give live births, including those with really neat social behaviors, are five times more likely to go extinct from climate warming than egg-laying species." Standing in his lab, Sinervo holds up a tiny piece of PVC piping, spray-painted grey. The pipe, meant to heat up just like a lizard, will be hooked up to a device that continuously records its temperature. Sinervo uses this setup to study rising temperatures in lizard habitats all over California. In addition, Sinervo has assembled a global team of herpetologists to monitor lizard habitats on every continent. They will determine how much of an effect global warming is having on lizard populations, and they’ll try to predict when a population might go extinct. Story ©2011 by Sandeep Ravindran. For reproduction requests, contact the Science Communication Program office. When I was a child, I caught fireflies to see how they glowed and watched caterpillars become butterflies. Nature seemed full of mysteries, and I became a biologist to unravel some of them. But when I got to the scientific front lines and studied how a parasite could take over our cells, the constant grind of inconclusive experiments wore down my enthusiasm. As a diversion, I started volunteering at a museum and answering genetics questions for its website. I was thrilled when I helped people understand a concept or when I heard them say, “That’s really cool!” After my Ph.D., I became an intern at Science Illustrated in New York. When I went to work each day, I once again saw a world full of mysteries. Each one was a potential new story to write. My bookshelf tells a story of how I enjoyed spending my childhood. Dusty field guides on insects, reptiles, and amphibians with pages ripped, books on entomology, and pet care manuals survive. In my drawer rests an incomplete sketchbook with scribbles of insects I found around my backyard. After entering high school my interests in drawing were overlooked; I took computer science and business as substitutes for art classes. After entering college I found relaxation in drawing again. Today I am excited about beginning a career which will allow me to continue drawing while remaining immersed in science. It seems my old sketchbook has become relevant once again, though hopefully with drawings better than my doodles from 12 years past. 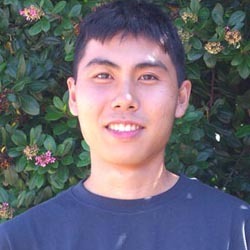 Ben is a Northern California native with a deep fascination with California ecology and its unique flora and fauna, and a particular interest in herpetology.